Some retailers hit your inbox as early as the beginning of the week, making you aware of their upcoming Black Friday deals. Most emailed the Wednesday before, trying to tempt you with deep discounts. Many decided to roll their Black Friday deals right into Cyber Monday and make a weekend out of it. And others decided to roll them into existing campaigns. Yet through the hundreds of Black Friday emails you probably received, surely only a few stood out. We gathered some up here to show you why these made great Black Friday Email Campaigns. JetBlue – Family, friends, food & flying – all of our favorite F words! They had us at the subject line, and the content wooed us over. They didn’t give you a deal. They gave you entertainment. Something fun, snackable and shareable. Further, they made themselves top of mind as you consider booking your holiday travel after Thanksgiving. Pretty clever. 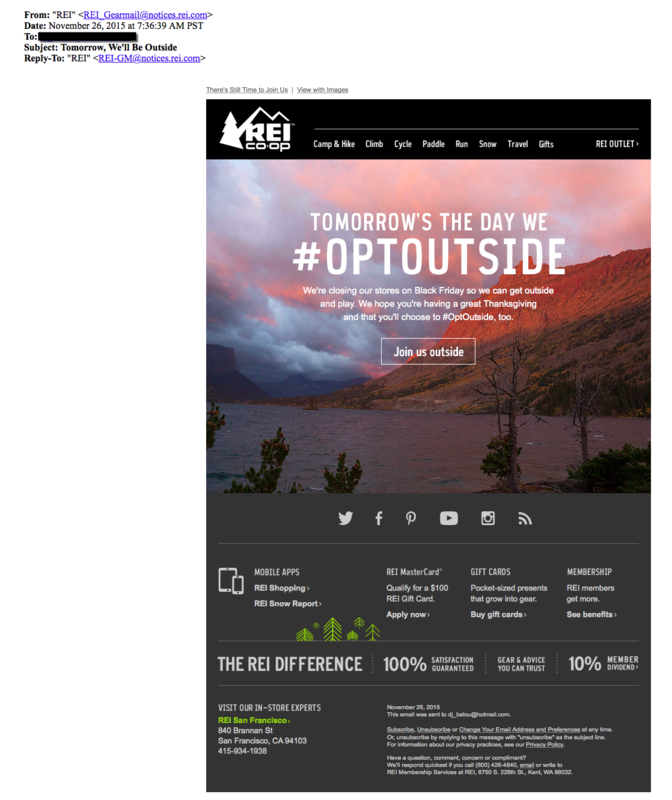 REI – let us know they would rather #OptOutside for Black Friday. Goorin Bros. Hats – Psst! Still awake? Here’s 50% off! 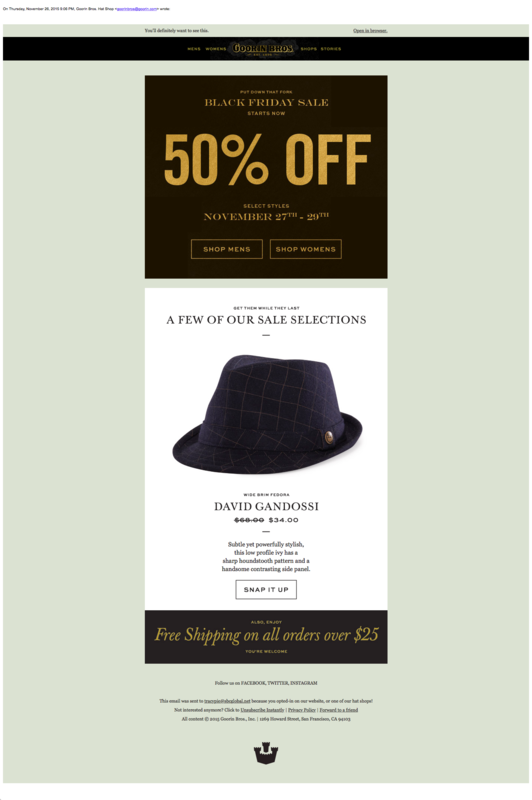 If on Thanksgiving night you weren’t starting to doze off from your second helping of tryptophan-laden turkey, then Goorin Bros. wanted to make sure you were awake and give you a jump on your holiday shopping with a 50% off sale that started Thanksgiving night. 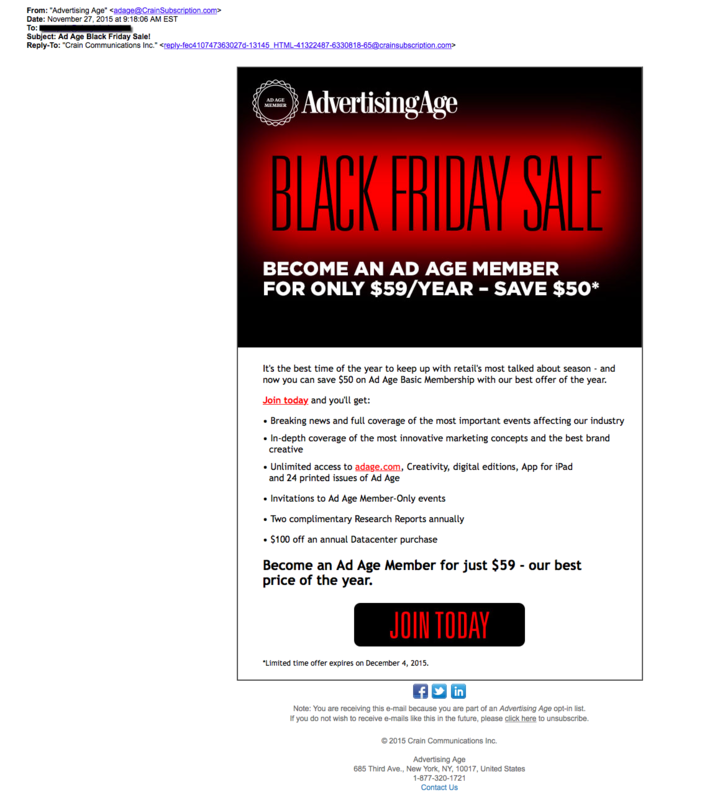 Ad Age Black Friday Sale! I opened this out of curiosity because I couldn’t imagine what they’d be offering. But not only was it timely, it was relevant to their business. Plus, the offer is extended through December 4th, well beyond Cyber Monday. 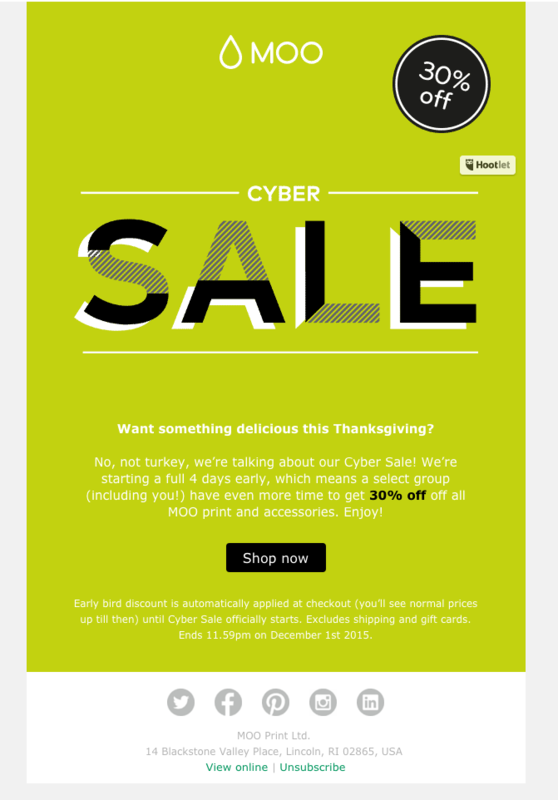 Moo decided to reward their customers with an early bird discount to the Cyber Monday sale. 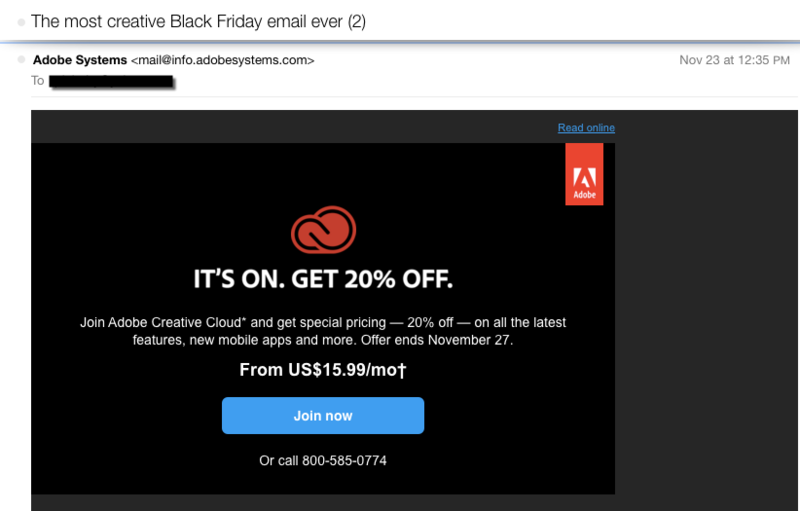 Adobe gave us a clever headline to try and sell us their Creative Cloud product, which made people open their Black Friday email. 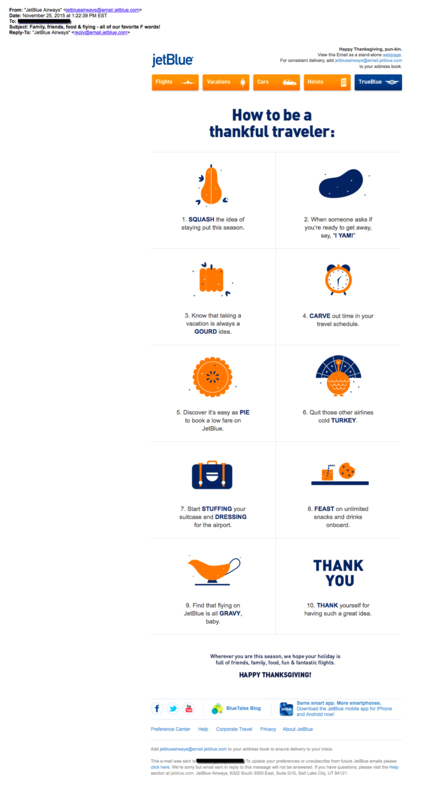 Instead of going wild and crazy they stuck simplicity for their email design. Whether you agree or not on whether that was a smart move, it still got you to open it. 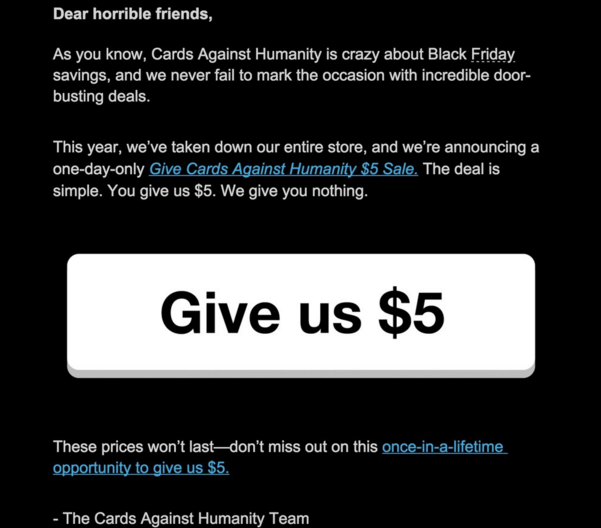 Were there any Black Friday emails you received that you thought stood out from the pack? Share them with us in the comments below.